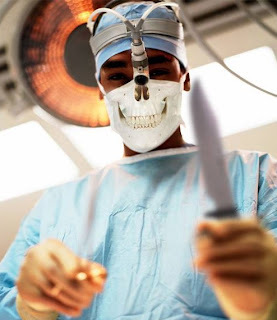 Remind me not to schedule elective surgery on Halloween. Meet Dr. Chain Saw. I believe Dr. Saw attended the University of Transylvania. He planned to specialize is hematology, but his professor, Dr. Dracula, was a night owl, and Dr. Saw did not want to attend night classes. I use to have a lot of fun working at the hospital during Halloween. A hospital that I use to work at let us wear costumes until a patient freaked out. The man coded, and the first thing that he saw when he came back was a respiratory therapist dressed up as the devil. The whole experience was very unpleasant. Too bad he didn’t notice the nurse who came to work dressed up as Florence Nightingale. It would have worked out better for all of us. 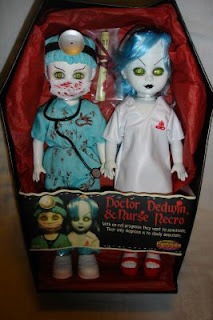 Dr. Saw’s associates, Dr. Dedwin and Nurse Necro, want to wish you all a Happy Halloween. I think it is nurse "Necro" not nurse Recro. ;) I would dress up as Hermione from Rowling's books but I thankfully am not working today. I am worked to death as it is, and not well supported. Thank you for the correction, Fetchinggal. I was having a hard time reading what was written on the box in the picture. She sure is a creepy looking thing. I forgot to add how nice and clean the Nurse's uniform is and how dirrrrrty the doc's is. Teehee!